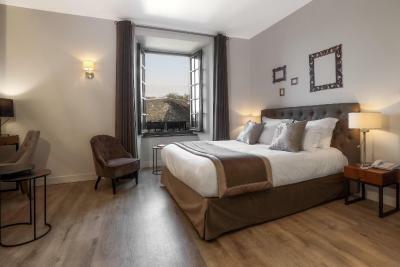 Lock in a great price for Hôtel Joyet de Maubec – rated 9.6 by recent guests! 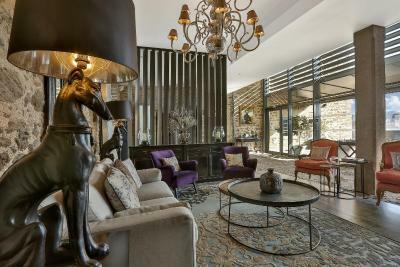 Exceptionally gracious host and staff with all attention given to the rooms and ambiance. Everything done with taste. Beautiful restoration done to the building. The restaurant was exquisite! Many thanks to Thierry for his kindness, and best wishes to Omega! Beautiful and comfortable. Lovely views. Comfortable bed. We loved the staff who were so accommodating in every way. Dinner and breakfast was superb!!! Highly recommend. We wish we could have stayed longer. Both Dinner and breakfast were delicious, we are so happy we decided to stay and will certainly consider staying here again when we come back to the region in the future. Lovely historic hotel with friendly staff and good food. Hard to find better! Perfect place to stay when traveling the region! 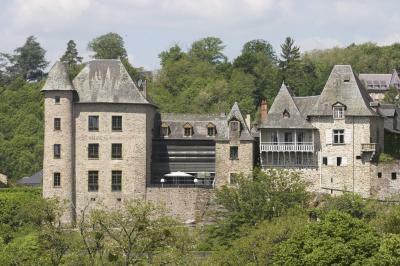 Completely renovated chateau with lovely owners and staff. Rooms are modern, clean and comfortable. Great value for money. The restaurant is also excellent both in terms of food quality, presentation and service...far superior to others you will find in the area. Thank you for the wonderful stay! Lovely building in the heart of the old town of Uzerche, with great views over the Vézère valley. Furnished tastefully, fully embracing the château chic vibe. Great restaurant, friendly staff and the dog, Omega, is super cute. The hotel is extremely nice and comfortable. 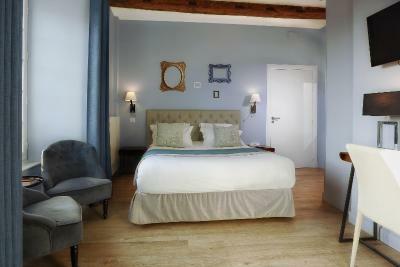 The rooms are nicely decorated and all details for the guest comfort are included. The service in the restaurante are very good and the food also. We have really enjoyed our stay in the Joyet de Maubec and will return for sure. 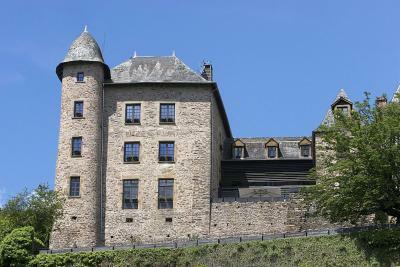 Uzerche is a very old village with little more than 3.000 inhabitants, surrounded by lush nature. If you are looking for peace and comfort, this is the right place to spend a few days. All the food was excellent - in particular the dinner where the steak was spectacular. Outstanding restaurant for dinner. Excellent breakfast. Very comfortable room with amazing view. 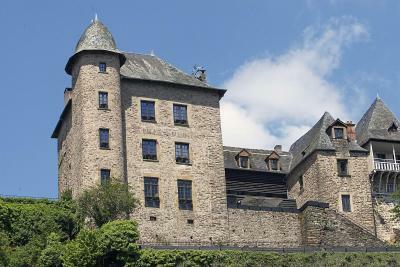 Set in a meander of the Vézère River, Hôtel Joyet de Maubec is located in Uzerche. It features a restaurant and free WiFi access is all areas. 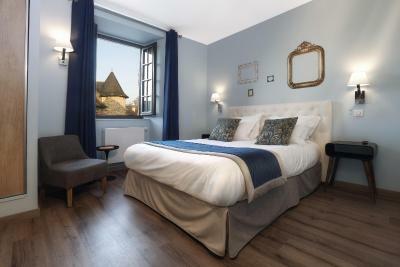 All rooms at Hôtel Joyet de Maubec include a flat-screen TV with cable channels, a mini-bar and an iPod dock. 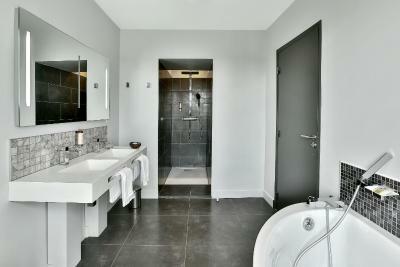 The private bathroom comes with a bathtub or a shower, a bathrobe, free toiletries and a hairdryer. There is a restaurant on site and a continental breakfast is served daily. It can be enjoyed in the comfort of the room. Guests can also enjoy a sauna, a fitness center, a terrace and a garden. 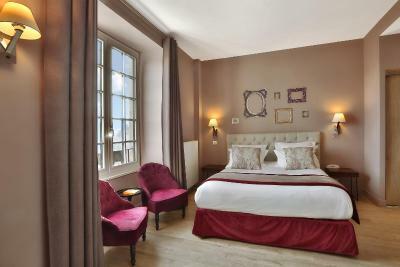 At Hôtel Joyet de Maubec you will find meeting facilities and luggage storage. A tennis court can be found just 1,650 feet away and canoeing is available 0.6 mi away. The nearest train station is 1.2 mi from this hotel. Free public parking is possible nearby. 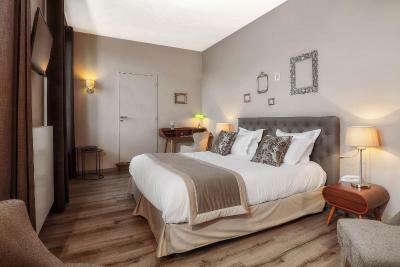 This property also has one of the top-rated locations in Uzerche! Guests are happier about it compared to other properties in the area. This property is also rated for the best value in Uzerche! Guests are getting more for their money when compared to other properties in this city. 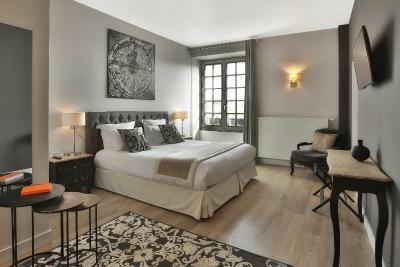 When would you like to stay at Hôtel Joyet de Maubec? 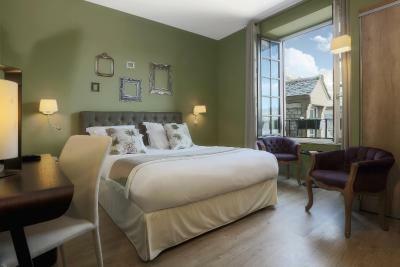 This double room has a mini-bar and a private bathroom with free toiletries. 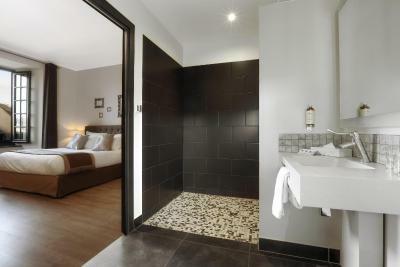 This larger double room features an iPod dock, a mini-bar and a private bathroom with free toiletries. 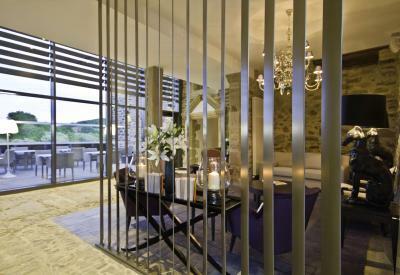 This suite features a seating area and a fireplace, as well as a private bathroom with free toiletries. 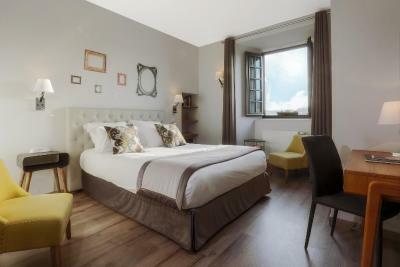 House Rules Hôtel Joyet de Maubec takes special requests – add in the next step! 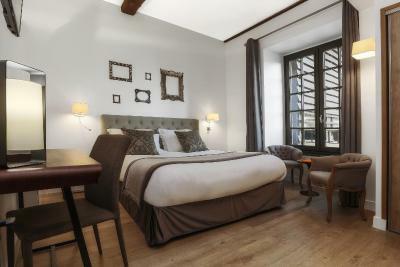 Hôtel Joyet de Maubec accepts these cards and reserves the right to temporarily hold an amount prior to arrival. It would have been useful to have a mirror in the bedroom somewhere, rather than just in the bathroom. And it would also have been good to have a regular black tea rather than just Earl Grey available. Beautifully clean. Staff very helpful and friendly, spoke very good English. Very nice bathroom and shower Gel amazing. Fine building, great staff and very good meal. Yoghurt quite a bit too sweet. The bed was firm and supporting but like a cloud. A firm, supporting cloud. Loved the shower and the seat in the bathroom, the wing mirror a nice touch as was the hair dryer. The iron and ironing board were a thoughtful touch, very appreciated. The soap was exquisite. Room felt spacious and beautifully appointed. A fabulous view over the river and rolling hills and the charming buildings of the town. The restaurant was better than excellent. Wonderful, interesting food which gave pleasure in the eating. The amuses bouches between courses a delight. I had the bream which tasted fresh and firm and appreciated its sauce.The wine was exceptional, even bought by the glass. The wine was transporting, arresting, dwelling long enough to cause discussion. The eggs were creamy and delicious, the cereal crunchy and not too sweet, juice exquisite and the seasonal fruits (strawberries) just right. Coffee rich and full. Loved the conserves and the butter came from the ground. At every level there was interesting decor and art on the wall. The foyer, terrace restaurant and breakfast room were airy and light, beautifully appointed but familiar, friendly, homely. You never felt uncomfortable in the atmosphere but welcomed, staff worked to meet your every need. We arrived late without advising them. We were greeted with warmth and welcomed into the restaurant past closing time. We were engaged in conversation and shared stories with Thierry and Daniel. It was like being in their home. I'd go to France just to stay at the Joyet. I'd change my travel plans to spend longer in Uzerche at the Joyet. I'd forgo Paris to stay at the Joyet.